To save this item in your Wish List, please register with our website. If you are already registered, please log in. Hand-crafted from French calf leather, this simply elegant bag is made in a compact, curved shape that perfectly moulds to the body. 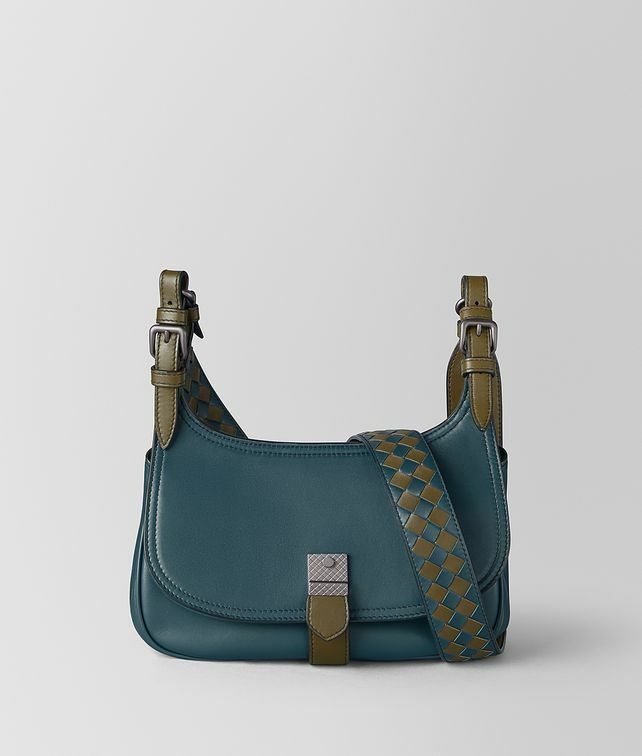 The style, featured in the Cruise 2019 presentation, is designed with a thick intrecciato chequer shoulder strap, finished with signature brunito buckles on each end. The front flap features a contrasting-colour leather strap and intrecciato engraved fastener. Height: 17 cm | 6.7"
Width: 24 cm | 9.4"
Depth: 7 cm | 2.7"
This item is available to pre-order. Your Credit Card will be charged solely when we ship out your order. The estimated shipping date for this item is: @@ExpectedShippingDate@@. The estimated shipping date for this item is: . Orders placed and delivered between November 19th and December 7th can be exceptionally returned until January 7th. Orders delivered after December 7th follow the ordinary return policy of 30 days.